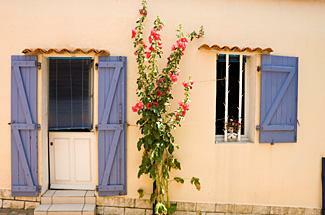 Homeowners looking for a way to add country charm to their home may want to consider installing a Dutch split door. Not only are these doors interesting to look at, they are also functional. During the early 1600s in the Netherlands, Dutch doors featured a design new to the world--top and bottom door halves that opened and closed independently from one another. First used as an exterior door, the bottom half of the door kept dried leaves and dust from blowing in while the top half remained open, letting in the fresh air. Another benefit to a Dutch door is that it eliminates the need for baby gates to limit a pet or toddler's access to another part of the house. Instead of taking the gate up and down as needed and trying to find a place to store it out of sight, Dutch doors offer an esthetically pleasing and practical answer to restricting your pet or child's admission to the rest of the house while still being able to hear and see them. Dutch doors are a unique feature for any home, but they also provide practical additions in businesses today. For example, you'll find Dutch split doors in offices where people need to sign in. The convenient shelf serves as the reception desk. This way patients or customers can speak with employees but cannot walk into the office area. Another popular use for Dutch doors is in preschool classrooms and nurseries where the top half of the door remains open for ventilation and the bottom half is secured to make sure children don't slip out and get hurt or into trouble. Old Wood Workshop - The Old Wood Workshop specializes in salvaged doors and wood products and because they do not manufacture or sell new products, what they have in stock is only in stock until it sells. 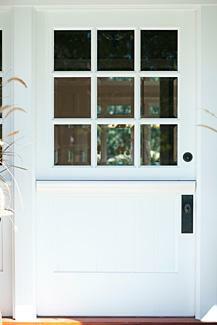 That said, you may be able to find a dutch door with a little wear and tear for a lot less than buying one brand new. When you buy from Old Wood Workshop, you're not only saving a door from a life in a landfill but you're getting a door with built-in character at no extra cost. Vintage Doors - VintageDoors.com has more than 45 different styles of dutch doors to choose from, or if you prefer, they'll custom build you the door of your dreams. All you have to do is tell them what you're looking for in your design and they'll get back to you with a price quote and a drawing of your door. If you like what you see, you accept the order and they'll start handcrafting your custom door. But, with so many doors to pick from, you may find exactly what you're looking for already in stock. Solar Innovations - Solar Innovations' dutch doors feature aluminum frames with panes of insulated glass for exceptional energy efficiency. Guaranteed not to rust, warp or rot, these doors are available in several different styles and can be customized as well. Cedar-Built Holdings - Cedar-Built's doors are made from high quality cedar wood and they are marketed toward greenhouse owners. These doors are preferred for greenhouses because cedar is better capable of withstanding moisture and humidity that often accompanies greenhouse interiors. These doors won't swell, warp or decay like other types of wood doors tend to do. When researching what kind of door you want to install, look beyond the charm and nostalgic feel offered by a Dutch split door and consider the fact that it raises the value of your home. These doors add a touch of history with a modern feel and come in a variety of styles to fit any home décor.